Travel writing has developed to the extent of extending the mere barriers of investigative reporting. Places of interest, people of significance and events of lasting remembrance have always embraced travel writing. In the compilation of nineteen essays, the Sinhala journalist Wimal Ranatunga attempts to present a panoramic study of his experiences in various places in the city of Polonnaruwa. 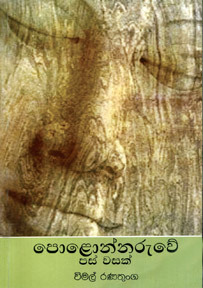 The book is titled Polonnaruwe Pas Vasak (Five Years in Polonnaruwa, a Swarnamali Publication). A researcher in the subject area of social sciences the writer Ranatunga obtained post graduate degrees, which has led him to involve in intensive studies in the area of Polonnaruwa. A press officer by profession attached to the Department of Media and Information, Ranatunga has not been a mere state official, as one notes under normal conditions. In a lighter vein he presents the difficulties he had undergone in order to settle down in a strange place hitherto unknown to him. He recalls the type of people whom he met and the type of attitude they had, and finally the human relationships where similarities and dissimilarities have to be encountered. In this manner, the very first entry into a historic place of stay, which he had known via textual readings, becomes a reality. Then he shows how he had to face the behaviour patterns and linguistic mannerisms of his fellow mates with whom he had to work with. A discussion of Wimal Ranatunga’s Polonnaruwe Pas Vasak will be held at the Sri Lanka Press Council (Near Mel Medura, Horton Place) on November 4 at 3.30 pm. Books with the author’s signature could be obtained for a discount price. Once these acquaintances enter one’s lifestyle, it is observed that a search for a cause becomes an interesting way of discovering aspects of history, folklore, archaeology, literature and technology. What the writer Ranatunga tries to presents thus becomes a rediscovery into these areas of information, which eventually becomes resourceful knowledge. He is seen taking the reader to such places as Bhuwava, Angammedilla, Dimbulagala, Kandwarawela, Somavathiya, Giritale and Palligoda, where he peeps into aspects of known and unknown historic matters. Perhaps the material laid down may be known by the informants who he had met in the field. But in the actual presentation of the very same material takes the shape of a narrative of interesting experience in rediscovery. In the feature titled as Orubande Siyambalaweve Prema Katha (73pp) the reader comes to know of a certain king who had met his sweetheart clandestinely by coming to see her at night. The place where the king tied his boat on to a tree was later discovered as a spot where a giant tamarind tree grew. According to folklore it is a love story of King Mahasena known to people as a demigod who had resurrected some agrarian matters which resulted in development. Yet another interesting legend revolves round an elephant who comes to worship the Somawathi shrine. The writer in his essay titled Somavathiya Vandina Aliyek presents how he had travelled to a much venerated place in order to see to own eyes who an elephant worships the shrine. The village known as Swarnapaligama is shown as the historic place where quite a number of significant events took place. It is also recorded the historical chronicle Mahawamsa. The king’s name Pandukabhaya is remembered as a person who had undergone much struggle both with his own relations as well as tribes. Some of the unknown events linked to the reign of this king is rediscovered by the writer Ranatunga in the essay titled Pandukabhayata Swarnapali hamuvu Kalahalga. This essay shuttles from the present to the past and to various aspects of the events in such places Kalahagoda and Anmedilla. Taking a synoptic view, I’m reminded of the tradition of beautiful writings in the west known by the term belles lettre. The writer Ranatunga blends information and experiences into an attractive readable narrative style which overshadows mere reporting. The entire compilation reminds me of childhood readings of some of the travel writings of D H Lawrence, as I remember, titled as Sea and Sardinia and Twilight on Italy. Travel writings of value could lead to better understandings of people, places and events enveloped in creative communication. For those young investigators and discoverers of socio-cultural facets of an ancient city like Polonnaruwa, the compilation of these 19 essays could be reckoned as an ideal gift. Many more books of this nature could elevate the levels of interest in the habits of reading. The writer too indirectly hints at the lesser degree of value and interests taken on the part of the conventional type of administrators appointed by the state to look after social matters relating fauna, flora and humans living in these areas. He in subtle dialogues and monologues create a certain sense of human on the ignorance on the part of the caretakers as versus real owners.